Hello, and welcome to JT Hughes. Today I'll be showing you around one of our used Approved Hondas. 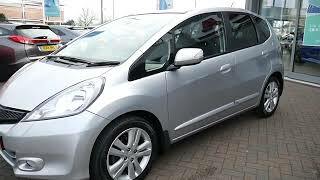 This one is a lovely little Honda Jazz. it's the 1.4-litre automatic with the CDT transmission, which is your 7-speed automatic. It's the EX model. Now, this one is in Alabaster Silver, and as you can see, has rear privacy glass, 16-inch alloy wheels. And this one, in particular, has had added reversing sensors, which gives you added an audible guide for when reversing. The Honda Jazz is famed for its gigantic sized boot for such a small car. The seats fold down on a 60/40 split basis. The vehicle comes in tremendous condition. From new, it had added some side moulding protectors on the body. This one comes with a set of front foglights. Take you inside the vehicle now. One of the lovely features of the Jazz EX model is its panoramic glass roof. It's height-adjust on the driver's seat and it has a leather-wrapped steering wheel, climate controlled, the air conditioning, power folding wing mirrors and a hands-free telephone kit. This one comes with the benefit of having a 12-month Honda Approved warranty, which you can extend for a further 12 months for the cost of £299. Finance is available from JT Hughes also. And if you want to take advantage of one of our flexible service plans, you can do by either paying monthly or upfront. So there we have it, one of our used, Approved vehicles from JT Hughes of Shrewsbury.